“Devi means shakti. And the manifestation of this shakti happens in various forms. Devi manifests herself in each being in different forms. NEW DELHI: “Devi means shakti. And the manifestation of this shakti happens in various forms. Devi manifests herself in each being in different forms. Today these awardees here are a source of inspiration for the society at large. Other Devis would also be motivated by them,” said Union Minister for Home Rajnath Singh. The cold chilly December evening, decked up in warm hues of black, red, and white, was a reminder to all the women that each of them is nothing short of a Phenomenal Woman. 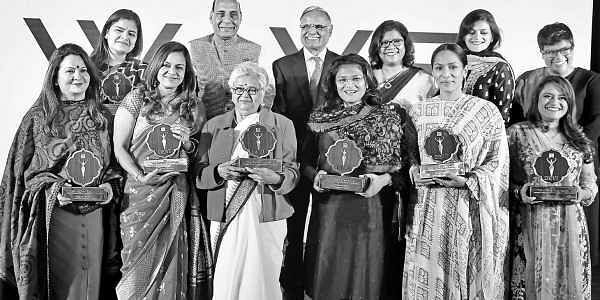 From going against tradition to fighting odds in life to giving to the society at large to envisioning a better tomorrow, the Devis who were felicitated proved that if you have a dream and are willing to go that extra length, everything is possible. Her City Montessori School, Lucknow, is a Guinness World Record holder for being the world’s largest. Made her directorial debut in 2012 with the much-acclaimed English Vinglish. Founder and CEO of Ampere Vehicles. Her e-vehicles cater to the differently abled. Founder of Varishth Nagrik Kesari Club. She is working on the concept of ‘adopting the elderly’, and invites people to contribute. Her House of Masaba is a big brand in India, the Middle East, Silicon Valley & Singapore. Founder-chairperson of Mpower. Hopes to alleviate the stigma about mental illness and provide care to affected ones. The Lok Sabha MP’s efforts for animal welfare and environmental conservation are noteworthy. Co-owner of six restaurants in Delhi and a one in Italy. Was awarded Ordine della Stella d’Italia, Italy’s highest civilian honour. Founder and director of Raindrop Media. Has a team of over 50 in Mumbai and Delhi. Plans offices in London, Dubai and LA. Set up The Jindal Arts Centre in 1992 NCPA, Mumbai. Helped in restoration work at Hampi temple complex in Karnataka. Accomplished IPS officer from 2002 batch of Karnataka cadre. Became the first female Superintendent of Police of Belgaum. She’s keen on the development of the North-East. This year, she started the ‘Women for 33%’ campaign.